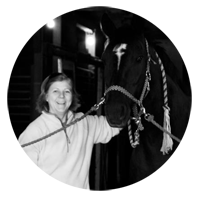 hint hint hint. . .. before reading today's blog, click on the class link above and register for a class? why not become a beekeeper? the bees really need us!!!!! or come learn about starting your own flock of beauties like these. . . . . I am just headed out the door to go pick up some Black Copper Marans eggs from a nice man named Lou in Rhode Island. Yes, I will drive two hours to pick up eggs. Chicken people do these things. I have sold roos to people from upstate New York and Southern Connecticut--3 hour drives each way. I had a young mom with toddler in the car pick up and take my stunning white Silkie roo, "Rudy Toot Toot" when he became too much trouble around here. Poor Minnie was worn out from his advances. Rudy the rooster. Remember the movie Rudy about the cocky, short football player at Notre Dame? It's all about attitude with little Silkies. You couldn't tell him that those big Americauna girls were not his type. He kept trying and trying, but all he really had was one other Silkie girl, poor Minnie. So. . . no problem. Last year, my hens came from muddy---read that as "almost impassable" backroads in New Hampshire and Vermont. But here is the downside of this kind of chicken buying. These birds are unvaccinated for Mareks. I hope to have Dr. Daughter, do that for me this year. (My daughter is a veterinarian) And sometimes backyard breeders don't keep the best records and you may end up with a bird that is less than what you expected. For instance, I have what should be a true Americauna, but she lays green Easter Egger type eggs, rather than the light blue that would be expected. I don't believe people are dishonest, but just bad record keepers. Green eggs taste just as good. And she is a beautiful Lavendar colored bird with all the right looks. Lou's rooster and a couple of his girls. You can find him on the Rhode Island Craigslist postings. 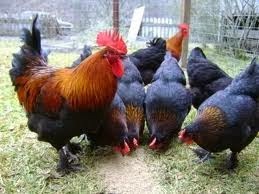 Lou's birds are Black, Blue and Splash Marans. 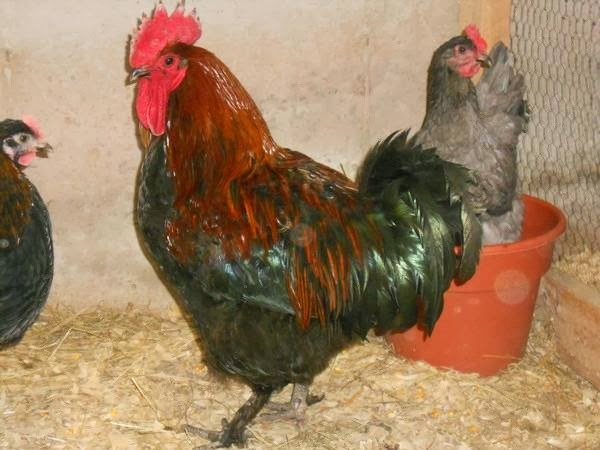 The rooster, he says, is a Black Copper Marans who produces birds that lay the very dark chocolate eggs that I most want. The chicks will be a mix of colors, so it will be fun to see how they turn out. This time of year, I think, most backyard chicken breeders do not have the spaces needed to keep one rooster with one hen, or type of hen, separated for breeding just for colors. We all have to huddle up for the winter to keep warm. I hope Mr. Rooster has been keeping warm with his hens. 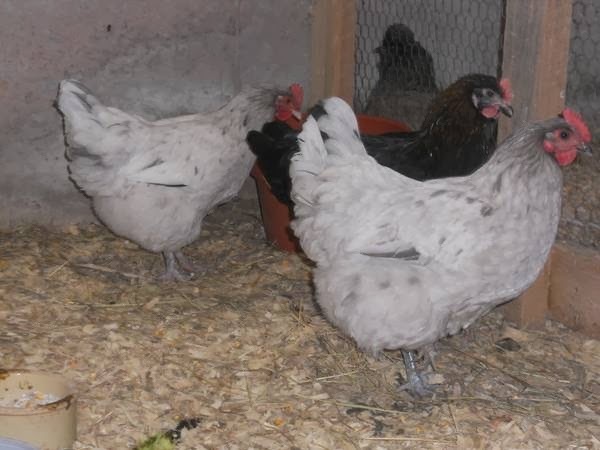 But I do hope some are true Black Copper Marans.